In the past few years, I have noticed more students are applying the word “novel” to any text they might be asked to study in class, whether that text is a book-length fictional narrative, a play, a poem, a political manifesto, or a collection of academic essays. I wrote up this lecture to introduce the concept of literary genre, in the hopes of communicating why it’s important that we recognize the word “novel” refers to the “novel” way that authors could tell stories via mass-produced printed books. Think of your favorite cartoon show. SpongeBob never changes much from episode to episode. Bart Simpson has been 10 years old for 25 years now. You can watch the episodes in any order and not lose anything important. Now think of one of those TV shows that feature epic events with casts of characters whose relationships change over time, like Downton Abbey, Game of Thrones, or The Walking Dead. Although the producers try to make every episode a self-contained story, if you watch the episodes out of sequence, you miss a lot. These shows are designed so that you can binge-watch them. A generation ago, if you wanted to watch a TV show, you had to wait until it appeared on your screen, at a particular time, once a week. If you missed a week, you couldn’t just download it and catch up. The technology of Netflix and DVRs means that we have a new way of watching TV, and Hollywood has provided a new kind of TV storytelling that makes use of that technology. A music video and a TV commercial and a reality show and a live news report may all use similar techniques (zoom lenses, music, closeups, etc.). But those tools work in different ways, for different effects. They are different genres. Now I want to talk about the genres of literature. We classify literature in three main categories: drama, poetry, and prose. Drama and poetry date from oral cultures, even before people began writing stories down. The word “prose” means ordinary language, without any special rhymes or rhythms. Fairy tales like “Little Red Riding Hood” or “Cinderella” weren’t created by any one person, so there is no single official version of those stories; every version you’ve ever encountered was a remix of some earlier version. Tales of Robin Hood or Paul Bunyan or King Arthur are kind of like episodes of The Simpsons, in that there are so many different versions of Robin Hood’s fight with the Sheriff of Nottingham, just as there are so many different versions of the time Bart annoyed his teacher or the time Lisa fought for her rights or the time Homer made a dumb mistake, we don’t need to encounter the stories in any particular order. Not all TV shows are episodic cartoons that can be consumed in any order, just as not all prose narratives are stand-alone adventures that can be read in any order. Remember how I just said that Netflix and DVRs created a new way of consuming TV shows — binge-watching — and that many TV shows today are designed with binge-watchers in mind? A “novel” was, at one time, a “new” style of storytelling, that developed along with the spread of mass-produced books (and the literary culture that created a demand for such books). It was the technology of the printed book that created a new storytelling medium that made the novel (the word means “new”) possible. As a student, I was carefully introduced to the novel as a special kind of nonfiction book, that let the reader experience another world through the orderly, realistic representation of the thoughts, feelings, and senses of a different person. There’s no other literary medium that engages a reader in quite that way, because our minds are actively engaged in co-creating and living in the world that the author is telling us about. “The Love Song of J. Alfred Prufrock” is a poem by T.S. Eliot. It was published in a collection of poems called Prufrock and Other Observations. In literary study, “Prufrock” refers to the poem, Prufrock refers to the collection of poems and Prufrock is the fictional character who speaks in the poem. None of these are novels. A short story anthology, such as O’Connor’s A Good Man Is Hard to Find and Other Stories, is a collection of short stories, one of which is called “A Good Man Is Hard to Find.” But neither the book nor the short story is a novel. Charles Darwin wrote a book called The Origin of the Species. 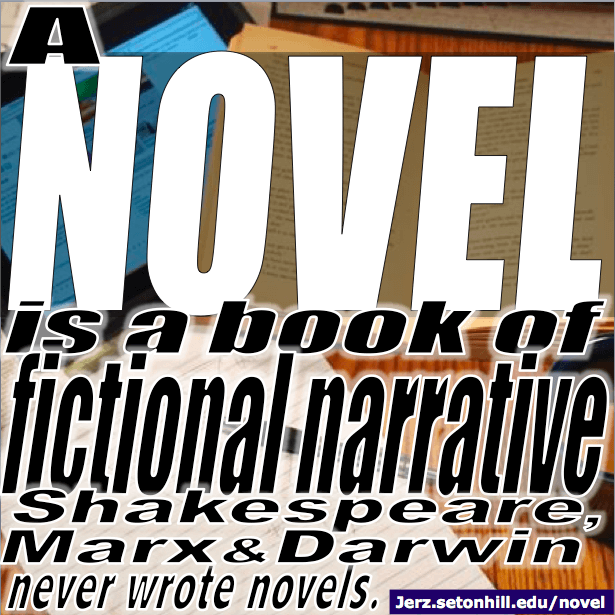 Darwin was a scientist and an author, but he was not a novelist, because The Origin of the Species is not a novel. Respond to these prompts. Number your responses. For full credit, demonstrate a willingness to engage with your peers via comments. 1) What does “fictitious prose narrative” mean? (What does each of those words mean? If you don’t know off the top of your head, look up the words… for example, I typed “define novel” in Google. 2) What does “representing character and action with some degree of realism” mean? Look up the terms, and explain in your own words. 3) Based on what you know now, what would you say to Gus Griffin if he referred Foster’s How to Read Literature Like a Professor as a “novel”? 4) If Gus asked you what he should call Shakespeare’s Hamlet, what would you say? 5) What is an example of a novel? What makes it a novel, as opposed to some other work of prose? 28 Jan 2015 in Academia, Books, Culture, Education, Humanities, Language, Literacy, Literature, Writing. This is a good novel on why people should choose their terms more carefully. ;-) Seriously — this misuse of the term drives me a little crazy too. I have been seeing students do what you did here — quote google as a source dictionary. Totally makes sense in a blog entry, but I have begun to question student use of google as a definining source, which I’m seeing in the classroom more and more. Isn’t google pulling this info from another (usually unnamed) source, like wikipedia or dictionary.com? Looks like Google uses the Oxford Pocket Dictionary of Current English, but that’s not clear from the online results.